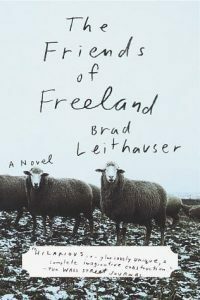 In this roomy, bawdy, exuberantly comic novel, Brad Leithauser takes us to an imaginary island-country, Freeland, during a crucial election year. Freeland occupies its own place in the North Atlantic, somewhere between Iceland and Greenland. A geological miracle, it is desolate (“What green is to Ireland, gray is to Freeland”)—and inspiring. The “friends” of the title are Hannibal, an expansive, lovable, unruly giant of a man who has been President of Freeland for 20 years, and Eggert, his shrewd, often prickly, always devious sidekick and adviser, who is Poet Laureate of Freeland and the book’s narrator. As the book opens, Freeland—long happily isolated and stubbornly independent—is in trouble. The sins of the rest of the world have begun to wash up on its shores in the form of drugs, restless youth, and a polluted, fished-out ocean. And, to add to the complications, when Hannibal, who has promised to step down as president, decides to run again, the opposition imports three “electoral consultants” from the United States. As the story unfolds, the histories of the friends are revealed. While Hannibal is Fate’s adored, Eggert travels perpetually under a cloud. Orphaned early, he must make his way by his wits. We follow him from his youth as he adventures Down Below (any place south of Freeland), collecting women, lovers, children, restlessly churning out fifty books in his search for love and admiration, returning home at last to raise a family and to serve his friend in his political hour of need. This huge, stunning, magical book brims with pleasures: delicious satire as the independent-minded natives meet the U.S.-trained “spin doctors”; a vibrant comic-strip vitality; and an edgy poignancy. Best of all, Leithauser has created a whole world, at once uncannily like and unlike our own. Readers who journey to Freeland will find it both a land of wonders and an ideal place from which to view the world they’ve left behind.